Staying Energized On The GO! As busy beings, we all need a bit of a lift for hectic days where our feet don’t seem to touch the ground. Often, we are stuck with healthy choices when we don’t do some forward planning…and so we end up diving into convenience snacks with little or no valuable nutrition content. It’s easy to pick up a donut with your coffee, it’s easy to grab that muffin with the smoothie you bought with the best of intentions at heart…but these calorific snacks pack more onto your waistline rather than increasing your energy levels. 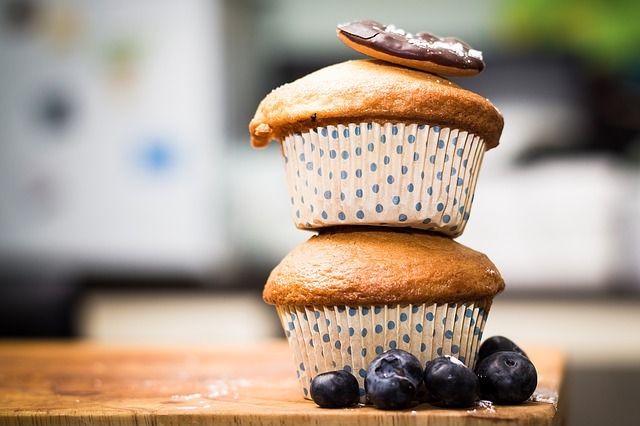 That muffin, donut, or yummy looking pastry can add a further 500 calories or so to what may already be a heavily laden sugary drink…even coffee, think about it- those flavorsome coffee syrups that cater to our taste buds every whim are high sugar too! We need to reprogram our minds so that we avoid quick-fix habits or solutions that are not healthy or energizing. Put simply, the better we snack, the more energized we will be. Choosing nutritious snacks that gradually release energy and contain vital nutrients and minerals really are the best way to get yourself going again- whether it’s a pre-gym indulgence or just something for your travels as you commute from one destination to the next. Here are some helpful tips for you to be more selective and snack wisely! Ok, so the packaging may look attractive…but did you check the reverse side to investigate the ingredients of that luscious looking snack? Checking ingredients before you buy is not a waste of time…it’s an investment in the better health of your mind and body. What looks good on the outside isn’t always a reflection of what’s on the inside- so check ingredients and labels first! Essentially, we are all wired to move and to create- and yet these are the two things that we seem to do the least! Wholesome snacks can be created at home which saves you time and money. It’s fun to experiment and you can involve your children too for a little extra creative direction, which of course, they will love! Be sure to include nuts, seeds, and dried fruit for extra fiber. Dark chocolate with over 70% cocoa has great benefits too- dark chocolate is higher in iron, copper, and magnesium and with anti-oxidant properties also. The higher the value of cocoa- the better it is for you, so add a few dark cocoa chips and enjoy! Planning ahead is the best way to eat more sensibly. When we are in a rush and caught off guard, we naturally don’t make good choices. If you know you have a busy week ahead with work, family, day-to-day commuting or keeping on track with your wellness goals- mindfully plan ahead and your body wins! As a fail-safe, always carry something to energize you in your bag, or even in the glove compartment of your car…! We are spoilt for choice with healthy food companies continuing to grow and develop their product lines to suit their customer’s nutritional needs. Even more so now as our bodies become more sensitive to toxins, pollutants, additives and food colorings that adversely affect our health. WOLO snacks have always been passionate about two things: Travel and Food! The problem they found was never having a great-tasting, all-natural, beneficial and practical snack that they could take along on the journey. So they stopped looking, and started experimenting! By combining their expertise and experience in food science, with their love of travel and food, they’ve worked hard to create what they believe is; the world’s best travel bar. 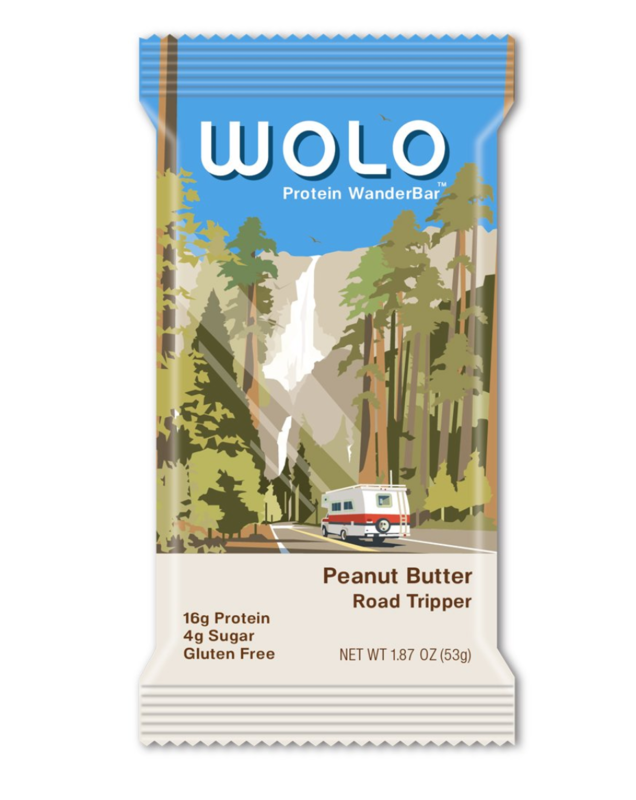 WOLO Protein WanderBars™ is the only snack made for the savvy traveler, a must-pack snack designed to enhance your travel experience by keeping you full, healthy and feeling great while exploring the world. WanderBars™ is packed with nutrients and made with a unique three-layer construction, beginning with a crispy bottom layer topped with velvety nougat and sprinkled with premium toppings. Toppings vary and include soy free white chocolate chips, real crushed peanuts, or premium milk chocolate chips ensuring no two bites are ever the same. Each WanderBar™ is a satisfying texture and flavor experience that keeps you going without crumbling or making a sticky mess. 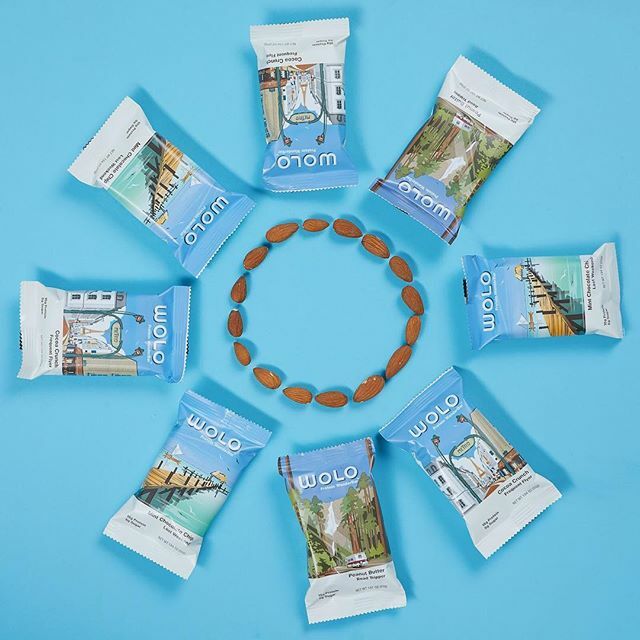 What’s in WOLO protein bars? They’ve purposefully packed each bar with ingredients, which are carefully chosen for the positive effects it has on your body and taste buds. They’re talking about protein to keep you energized, nutrients to keep your body strong, and antioxidants to support your immune system. Each bar is all-natural with 15 to 16 grams of protein, 4 to 6 grams of sugar, and high in fiber. WOLO has a quality blend of protein that consists of whey, milk and pea protein to give you energy. Each Bar consists of 60% of your vitamin C intake in one bar and zinc to boost immunity. Important key antioxidants such as flaxseed to aid in digestion, turmeric to improve blood flow and decrease inflammation, and coconut oil with bacteria-fighting, anti-fungal properties to help fight off infections. WOLO WanderBars™ is gluten free, soy free, Kosher Dairy certified, and one of the cleanest tasting snack bars out there. Here is what’s on offer at WOLO! 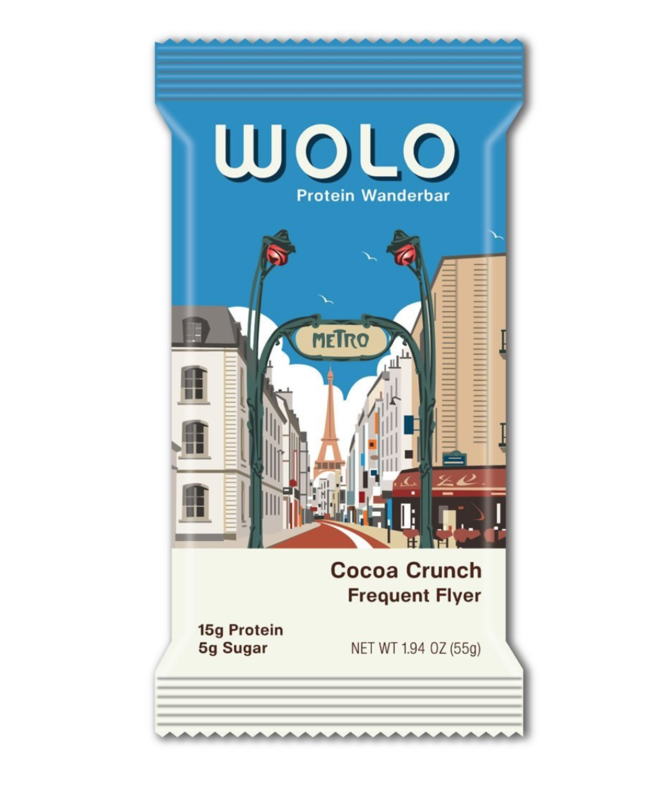 WOLO Protein WanderBars™ currently offer 5 flavor destinations with unique travel inspired packaging that is one of kind and created especially for WOLO. Flavors include Cocoa Crunch-Frequent Flyer, Mint Chocolate Chip-Lost Weekend, Peanut Butter-Road Tripper, and soon to be released Lemon Cake-Dessert Oasis and S’mores- Happy Camper. Meet Peanut Butter-Road Tripper…some roads are paved. Some are not. But each road is a path that leads us somewhere. Kind of like our Road Tripper WanderBar™. It’s paved with peanut butter, real crushed peanuts, and more real peanut butter. From the crispy bottom layer to the soft, chewy layer on top, whatever road you’re on, make sure to bring along the peanut buttery goodness of a Road Tripper WanderBar™. Meet Cocoa Crunch-Frequent Flyer…Flying isn’t for everyone. But our Frequent Flyer WanderBar™ definitely is. As our most mellow flavor, travelers appreciate the perfect balance of crispy chocolate on the bottom, with the soft, almond butter infused layer on top and finally topped with premium chocolate chips. Not too strong, and not too sweet, people enjoy it most with a cup of coffee. The best reasons to choose WOLO Protein! WOLO Protein WanderBars™ is dedicated to helping you reach your destination with great tasting, all-natural, protein-packed travel bars. They are low in sugar, high in protein and always SOY and GLUTEN-FREE, healthy snacks to refuel you just when you need it! * The information available on ewellnessmag.com, including text, graphics, and other materials are for informational purposes only. Reliance on any information in ewellnessmag.com is at the user's own risk. Sponsored product placement may appear in the article. The visitor of this website acknowledges that the information available on or through ewellnessmag.com is not and is not intended to be a substitute for professional medical advice. Copyright © 2018 Brawo Press, Inc. All rights reserved.